When a child dies, most parents assume their marriage will be in jeopardy because they have read that 90% of marriages fail after the death of a child. A recent survey has proven this supposed fact to be a myth. From the survey, it was found that only 16 % divorce and only 4 % said it was because of the death and the fact that there were problems in the marriage before the child died. The untimely death of a child can be an opportunity for growth to bring the two people closer together, rather than tear them apart. I have 10 ways to make sure your marriage does not become one of the statistics. These ways include: talking about the child, giving each other space and time to grieve differently, talking to friends about your relationship to ease stress, going off on your own to get a new perspective, reviewing your day together, pleasing your spouse with activities he enjoys, not blaming each other, accepting the death through counseling, learning new coping techniques to live together without the child, and turning to God and religion if it suits your situation. TALKING ABOUT THE CHILD – Remember the good times or funny incidents. Laugh at something silly that your child did as well as remember any awards, honors and graduations that made you so proud. Don’t dwell on how your child died. That is not going to bring him or her back. If you feel guilty about something, talk about it. If you are angry about something, talk about that also. Couples have a bond with their child that no one else can match and by talking about those bonds and your feelings, you may realize how very similar you feel or at least respect the opposite feelings of your partner. You may also decide it would be a good idea to do something worthwhile in your child’s memory, like start a scholarship or plant trees in their honor, always a satisfying experience. GIVE EACH OTHER SPACE AND TIME TO GRIEVE DIFFERENTLY – The chance of both parents grieving the same is unlikely. Parners should allow each other the space to grieve at his/her own rate and in his/her own way. Personality, previous experiences and your own style of grieving contribute to that respect of grieving space. If one partner wants to cry, that doesn’t mean the other one has to cry. If one parter doesn’t feel like going out, he or she shouldn’t feel obligated to do so. If you can’t decide what to make for breakfast, don’t worry about it. Your child died; you need time to adjust. TALKING TO FRIENDS ABOUT YOUR RELATIONSHIP – This can ease the stress buildup. Perhaps your friends have a good resource for any problems. You may also need to express feelings about your loss to friends that you are not ready to discuss with your spouse. GOING OFF ON YOUR OWN – This can be for a few hours or a day. It may give you a new perspective. Don’t bring your spouse down or make them suffer with sarcastic comments or harmful accusations just because you feel miserable. REVIEW YOUR DAY TOGETHER – coming together at the end of the day is important. Review with your spouse what has happened that day, how you are feeling and what you are thinking. You will more than likely learn a lot about your partner during this period of your life. PLEASING YOUR SPOUSE WITH ACTIVITIES HE/SHE ENJOYS – Look for ways you can ease some of his/her pain. Do some activity with him/her that you don’t usually do but know the other would like you to do. Make a special meal that the other enjoys eating. Or do something related to your child that up until now you have not been able to do. NOT BLAMING EACH OTHER – This leads to stress, which in turn leads to marital problems. Shouting, not speaking or putting the blame for the death on each other (if you had been on time, he wouldn’t have had to walk home from school, get kidnapped, raped and murdered) does nothing but make the relationship stretched to it’s limits. 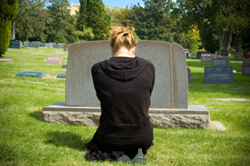 ACCEPTING THE DEATH THROUGH COUNSELING – There are times when a professional counselor can help a relationship and therefore the entire situation. Sometimes counselors are used as a last resort. Others prefer to accept help immediately, knowing that whatever they say may be misinterpreted. There is no guarantee of the outcome but many times worth it to try. LEARNING NEW COPING TECHNIQUES – Hopefully, you are one of the couples that really wants to move on with your life, but just needs some help to do that. Read books (mine will do), attend seminars, talk to others who have gone through this and survived and try many techniques out on each other. If one doesn’t work, try another, until you find what works best. TURNING TO RELIGION AND GOD – Some couples tell you they couldn’t have made it without their faith. By going to a church or temple, they are comforted by words, prayers and God. He can be your buoy in the hurricane. The number one thing you can do to protect your marriage is to draw strength from whatever sources will sustain you. Saving your marriage after a child’s death and moving on with your life as a couple is the goal for most couples. Finding the best way to help you do this is my goal and, I hope, yours also. Thank you for sharing your article on marriage after the death of a child. I have found that my husband and I have had to learn to be a couple again.